From decadent medieval popes to modern televangelists with private jets, religion and money can make for an unsavoury mix. But why do we think of charity – care for the poor and the sick – as a good thing in the first place? People in the Graeco-Roman world didn’t think so: they mostly thought the poor and suffering deserved what they got. This segment looks at research into the ways that modern churches and individual believers serve their communities. JUSTINE TOH: Petersham is an increasingly wealthy inner-city suburb of Sydney. This used to be a working-class neighbourhood, but the housing boom has seen an influx of well-heeled professionals. Still, here you’ll find plenty of people struggling to get by. Family breakdown, social isolation, mental health issues, and joblessness can all conspire to make life particularly bleak. But, at All Saints, the door is always open. Locals can share lunch at the weekly barbeque, pick up a freezer meal, or fill a shopping bag with discounted groceries. They’re welcomed, supported, and encouraged. Researchers have studied the ways that churches and individual believers serve their communities and found some surprising results. CRAIG CALHOUN: People who are embedded in a religious community are much more likely to be engaged in civic activity. Some of that is inside their religious community – Christians who are doing things in their churches. But much of it extends beyond it. They are more likely to vote, they are more likely to get involved in charities, they are more likely to volunteer in various settings from hospitals to schools. So, religion may motivate people to do that but it also gives them what some scholars have called social capital – a combination of networks and other resources that make it easier for them to participate. CORWIN SMIDT: The types of questions that are asked in survey research about the kinds of things that people do – are you more likely to give blood, are you more likely to work in a soup kitchen, are you likely to get up out of your seat to give someone else a seat on the bus or on public transportation? – in some ways these things are very small items, but they are reflective of a broader perspective. And in those instances, higher levels of religiosity, even controlling for all the other factors such as education or income or gender, even geographical location let’s say in the United States, all those things taken into account, it’s still true that religious people tend to exhibit these kinds of behaviours at much higher levels, frequently at a statistically significant higher level than those who are lower in religiosity. JUSTINE TOH: Even in supposedly post-Christian Australia, the data points in the same direction. The religious “bump” seems real. 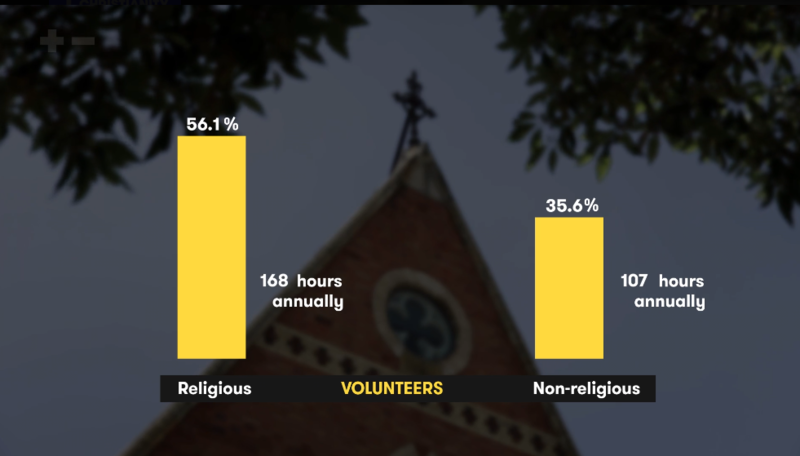 People who regularly attend religious services are more likely to volunteer than people who say they’re not religious, and to do more hours of volunteering. 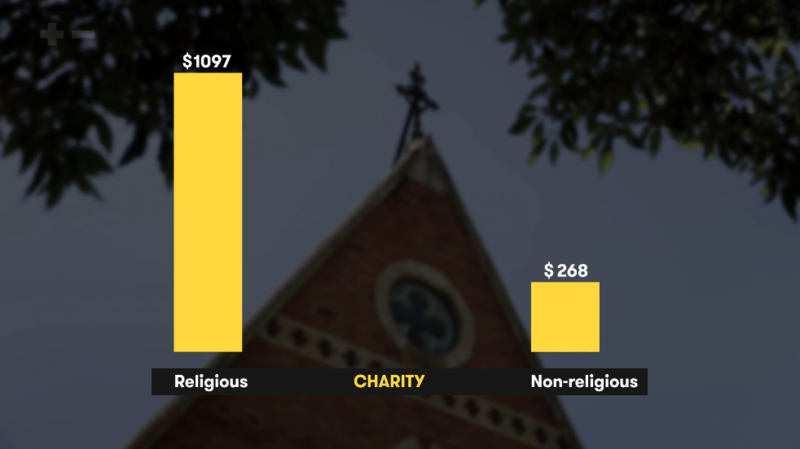 And while most Aussies give money to charity, on average regular churchgoers give significantly more each year. This isn’t to say Christians are better people than non-Christians. But as the writer C. S. Lewis once said, it seems like they are better than they would be without their Christianity. Usually. FRANCIS SPUFFORD: It is perfectly possible, I’m afraid, to go to a church and go “help”, and have them go, “I’m sorry, we’re busy with the flower arranging”. But it doesn’t always happen like that. It’s observable that Christians are particularly drawn towards service in those situations where things really can’t be made better, where the best you can do is keep suffering company, applying love in small, individual, practical ways. There is no possible PR for these things but they push the world gently but persistently towards being a kinder and less wrecked place than it would be otherwise. JUSTINE TOH: Plenty of people are wary of religious types, and that’s understandable. But if you can trust the stats, and the history, then maybe a bunch of Christians moving into your neighbourhood might not be such a bad thing after all. JOEL EDWARDS: If you’re looking for the significance of a community which believes in human dignity, which believes in, yes, the salvation of the soul, which believes in, yep, the lordship of Jesus Christ, but equally who believes that we want to be judged not just on our beliefs as Christians but on our service to the whole community, people of all faiths or none, then look for what we are doing, look for the life of the church in its service to its community not just in who is pushing the doors open on a Sunday morning, you may miss what’s actually happening in the life of a church committed to engagement. Should local churches be more involved in serving their communities? Why or why not? Find or sketch three images that describe your idea of a perfect neighbour. Churches are not very involved in my local community. Religious people seem to do more volunteer work than non-religious people. It would be good to have a Christian neighbour. Read this short article, “Anglicare opens new community pantries in St George and Sutherland Shire.” In what ways do you think this initiative will help the community? Describe how All Saints church in Petersham helps the local community. Outline some of the needs in society that churches and individual Christians are involved in meeting. Look at the following graphs. Write a sentence for each graph explaining what the different numbers refer to. Nivison-Smith, I. and Lyons, M. (2006), “The relationship between religion and volunteering in Australia”, Australian Journal on Volunteering, Vol. 11, No. 2, p.29. Lyons, M. and Nivison-Smith, I. (2006), “Religion and Giving in Australia”, Australian Journal of Social Issues, Vol. 41, No. 4, p.426. While he says that Christians are often particularly drawn to “applying love in small, individual, practical ways”, Francis Spufford also says, “It is perfectly possible … to go to a church and go ‘help!’ and have them go, ‘I’m sorry, we’re busy with the flower arranging’.” What could explain such inconsistency in behaviour? What does the video suggest motivates Christians to help others in their community? Write a tweet to summarise your reaction to the video. List the “good deeds” commended by the king (v.35-39). Explain the comparison Jesus makes between a person’s treatment of others and the way they treat Jesus himself. What motivation does this passage give for helping others? Why does the author say that faith without action is not enough? How should those who take this Bible passage seriously treat people in need? How could these passages, and other Christian teachings about helping those in need, contribute to the common good? Andrew Leigh, in his book Disconnected, describes social capital as “networks of trust and reciprocity that link multiple individuals together”. He also makes a distinction between “bonding” social capital (which joins together similar people) and “bridging” social capital (which transcends boundaries of race, ethnicity or income). Explain why social capital might make it easier for someone to participate in civic activity such as volunteering. Explain why people who attend church might have a high level of “bridging” social capital. In small groups, draw a mind map of your own social capital – the networks that you belong to. Make a list of some individuals, groups, or organisations you know of that are involved in some kind of action to benefit your local community. What do you think motivates these individuals or groups to serve the community? Does their example make you want to serve your local community too? Why/why not? What is one way that you could help serve your local community? Read this article by Simon Smart in ABC’s The Drum, “So religion makes you meaner? Not according to the evidence.” Write your own “online comment” responding to the article. Hold a debate to answer the question: “Is caring for the poor a good thing?” You may want to watch the segment “Being poor in the ancient world” to help you.